Root and hypocotyl diseases can be significant problems in lupin crops, reducing stand density, plant vigour and yield. Root rot occurs in nearly all narrow-leafed lupin (Lupinus angustifolius) paddocks but in the majority of paddocks root disease has only a small impact on crop development. However, in paddocks where high levels of root rot occurs, plant establishment and seedling vigour are significantly affected. 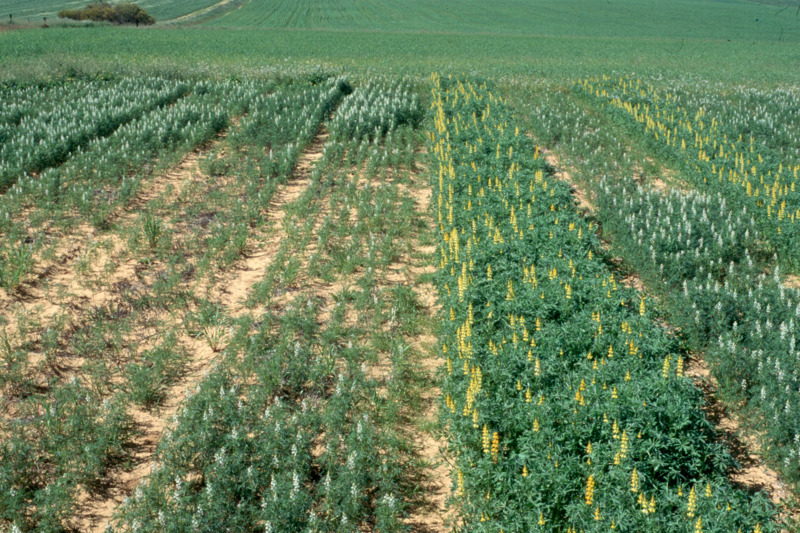 Pleiochaeta setosa and Rhizoctonia solani are the pathogens commonly associated with root or hypocotyl infection of lupins. When a root disease is present in a crop very little can be done to manage it in that cropping season. It is therefore vital that the cause is correctly identified to allow appropriate management to take place before sowing the next lupin crop. Correct identification can be made from symptoms on the root and hypocotyl of affected plants. Above ground symptoms such as poor emergence, patches in crops, uneven and stunted growth, yellowing of plants and wilting or death under water stress, particularly at flowering and grain fill, can indicate the presence of root disorders. These above ground symptoms are rarely diagnostic as many biotic and abiotic disorders will have similar above ground expression. This page describes above and below ground symptoms of the common root and hypocotyl diseases occurring in lupins in Western Australia. Management recommendations for each are outlined. This disease is caused by Pleiochaeta setosa, the same fungus that causes brown leaf spot of lupins. Spores produced on fallen brown spot infected leaves are incorporated into the top few centimetres of soil where they remain until the next lupin crop is sown. This fungus is commonly associated with root rot lesions but rarely causes major crop losses in current farming systems. Affected plants are often widespread within a paddock and above ground symptoms include wilting and death of seedlings or generally poor growth of plants. Infection produces dark brown lesions on the tap and lateral roots leading to stripping of the outer layer of the root and in severe cases complete rotting of the root. Tap roots are susceptible for 6-8 weeks after germination; however, new lateral roots are susceptible whenever they emerge during the season. Reduced or minimum tillage sowing operations reduce the incorporation of spores into the rooting zone of the soil profile. Deeper sowing places the emerging roots below the spore laden soil layer, this is particularly important with sowing systems utilising tillage systems. Rotation with non-host crops (for example, cereals, canola, pasture) reduces the concentration of soil borne spores. Reducing brown spot in preceding lupin crops can reduce the amount of spores returned to soil.